I’ve just turned up this postcard. 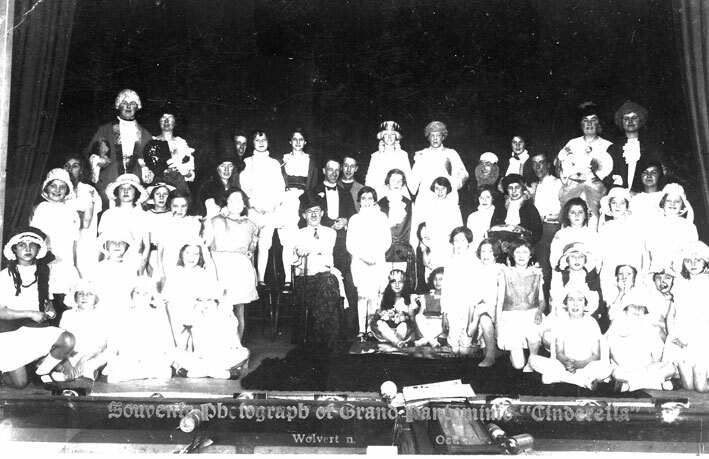 It’s inscribed Souvenir photograph of Grand Pantomime “Cinderella”. It is dated Wolverton October 1928. I think I can see my aunt in this. She was then about 19. I don’t know any of the others, although it is possible that some of the younger ones in this picture are still alive. I am intrigued to find out more about Mr F E Archer Smith. Judging from this and the other programme I published he wrote, acted in and produced plays around North Bucks. This one from Fenny Stratford’s Town Hall, and it must be remembered that at this time Fenny Stratford was a more significant town than Bletchley. Judging from the cast names the plays appear to be “of their time” in that the characters were mainly drawn from the aristocracy or upper middle classes. Working class people only appear as minor characters as servants or villains, known by surnames only, like “Hawkins” or “Shrivens”. 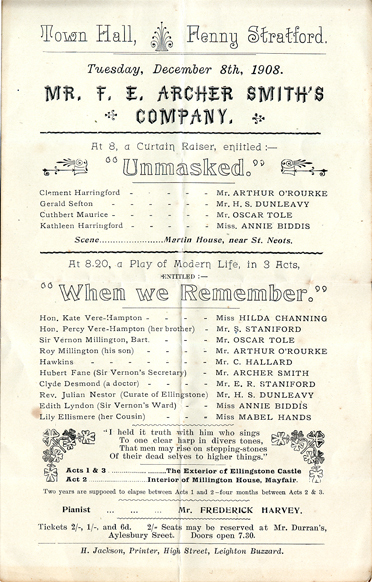 My Great Uncle Bert Dunleavy was, it seems, something of an amateur thespian, and I have just come across some papers relating to this. 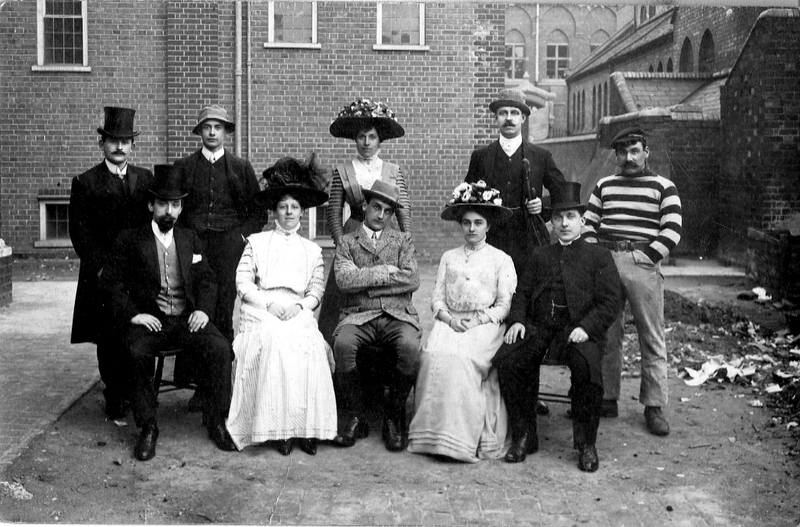 The photo, printed on a postcard, appears to be taken at the back of the Church Institute, which was then very new, as you can see from the brickwork. On the right you can see the Wesleyan Chapel and the Science & Art Institute in the background. 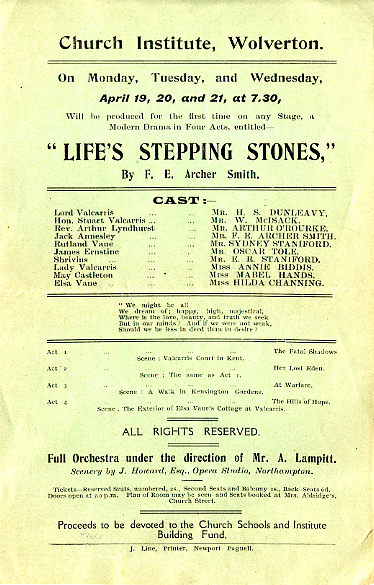 This is the cast of a play called “Life’s Stepping Stones” written by a man called F E Archer Smith who also acted in the play and appears to have operated his own amateur dramatic company in North Bucks. The programme is reproduced below. It may be possible to identify the people in this photo from the cast list. I can only identify Bert Dunleavy, standing second from right. There is no year on the programme but I can identify it as 1909 from the back of this postcard, sent by my uncle to Miss Yates at 41 Cambridge Street. He lodged there as a boy apprentice in 1895 after his parents moved to Linslade. 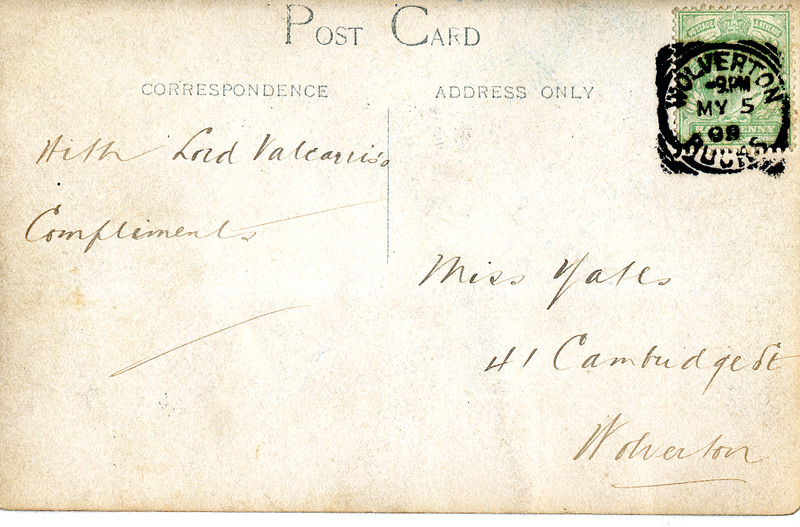 As you can see from the franking of the half penny stamp, it was processed at 9pm May 5th 1909.